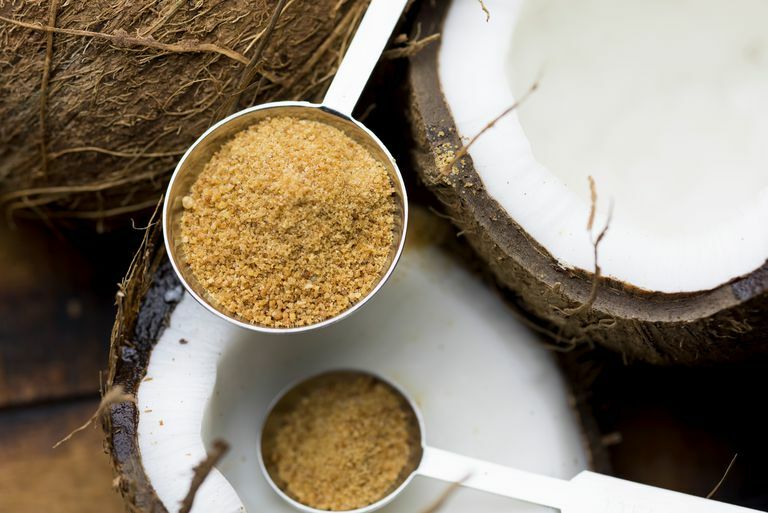 Is Coconut Sugar Really Low Carb? Is coconut sugar, also called coconut palm sugar, healthier or lower in carbohydrates than regular table sugar? There are claims that it is a low-carb sugar that doesn't raise blood glucose as much as other sugar and that it is loaded with minerals. Let's look at what it is and whether any of the claims have merit. All forms of sugar are concentrated forms of natural plant sugars. They might come from sugar cane, sugar beets, maple trees, flower nectar (honey), agave plants, rice, etc. They are fairly similar, with approximately 15 calories and 4 grams of sugar (carbohydrate) per teaspoon. Coconut sugar is no exception. Coconut palm sugar is produced from the nectar of coconut flower buds. The buds are cut open and the sap is captured, and then boiled down. The result is a caramel-colored sugar that has similarities to brown sugar. You may also see "palm sugar" which is a similar sugar obtained from other types of palm tree than the coconut palm. How Glycemic Is Coconut Sugar? Some purveyors of coconut sugar make the health claim that doesn't raise blood sugar as much as other sugars. Indeed, there was a report produced by the Philippines Food and Nutrition Institute which has been widely cited (but has been withdrawn from the Internet) that said that the glycemic index of "coco sugar prepared by the Philippine Coconut Authority" was calculated to be 35, based on the results from 10 test subjects. This is indeed quite low. On the other hand, a similar study reported by the University of Sydney came up with a glycemic index of 54, which is only a little lower than that of table sugar. There are a couple of possibilities to doubt the claimed low number. 1. There was no indication of the range of responses in the report. Almost always, the report of a glycemic index study will state not only the average response to a food but the range of responses—how different people responded. This was not done in the Philippines study. Did some of the 10 people have a much higher response? We don't know. Glycemic index tests are almost always done on healthy young adults who are the least likely to have problems with blood sugar. People with diabetes, pre-diabetes, and "pre-pre diabetes" often react differently. 2. It doesn't make sense. There is no coherent explanation as to why this sugar is different from all other sugars in its effects on blood glucose. According to industry descriptions, the sugar in coconut sugar is largely sucrose (half fructose and half glucose), so one would expect the glycemic index to be similar (about 60 to 65). One explanation could be that it is actually largely fructose, similar to agave syrup. Since fructose doesn't raise blood glucose, a high fructose component would not cause as much of a blood glucose response. But they are saying that the fructose concentration is comparable to other sweeteners such as honey, maple syrup, cane sugar, etc. So it makes no sense that coconut sugar would act differently in the body. The American Diabetes Association says that people with diabetes should use coconut palm sugar the same as they would regular sugar. They also note that some of it is mixed with cane sugar and other ingredients. Is It Rich in Minerals? "Coconut sugar is loaded with minerals," websites selling it loudly proclaim. The claim can best be made for potassium. According to data released by the Philippine Food and Nutrition Research Institute, the amount of potassium in half a cup of coconut sugar is significant—over 1000 milligrams. The daily recommended intake for an adult is 4700 milligrams. But is consuming half a cup of sugar really a good way to get potassium? The amount in a teaspoon is 43 milligrams—not so big a deal, especially compared with most meats and vegetables. For example, half a cup of most cooked greens have between 400 and 500 mg of potassium, and a 4-ounce serving of most meats is about the same. The amounts of other minerals in coconut sugar is vanishingly small for the amounts people would actually eat. That same half a cup of the sugar contains 29 milligrams of magnesium (compare to 76 milligrams in half a cup of cooked spinach) and 2 milligrams of zinc. "The most sustainable sugar on the planet," some websites state. There are real environmental problems with sugar cane production that are not present with coconut sugar production, where the tree can keep producing the sap year after year. According to industry websites, less water is used, and coconut palms can grow in very poor soil, such as sandy beaches. However, would it have less impact compared to honey or maple syrup? Once a coconut flower is tapped for the sap, it will not grow into a coconut. Since coconut farmers may get more money for coconut sugar, some of the trees that were in coconut production have been being tapped for coconut sugar instead. This may result in rising prices of coconut meat, milk, and oil. Coconut sugar is very expensive sugar. As per the recommendation from the American Diabetes Association, use it as you would regular sugar, following your own personal precautions. It is likely no better than any other sugar for people following low-carb ways of eating. Coconut Palm Sugar. American Diabetes Association. GI Foods. University of Sydney. Trinidad TP, Mallillin AC, Sagum RS, Encabo RR. Glycemic index of commonly consumed carbohydrate foods in the Philippines. Journal of Functional Foods. 2010;2(4):271-274. doi:10.1016/j.jff.2010.10.002. Trinidad, TP. Nutritional and health benefits of coconut sap/sugar/syrup. Food and Nutrition Research Institute. What Is the Banting Diet?